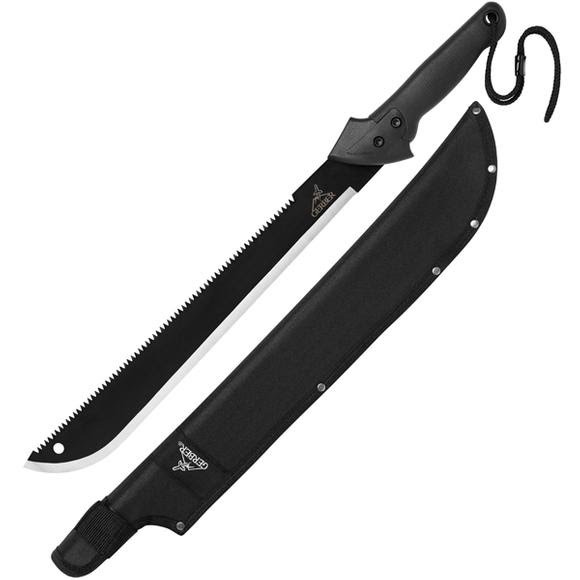 The Gator Machete wields a 15 inch fine edge blade on one side, a 15 inch high performance saw blade on the other, and Gerber's proprietary Gator rubber grip for ergonomic control while using either. The riveted, nylon sheath provides safe, durable transport. The Gator Machete wields a 15 inch fine edge blade on one side, a 15 inch high performance saw blade on the other, and Gerber &apos;s proprietary Gator rubber grip for ergonomic control while using either. The riveted, nylon sheath provides safe, durable transport. A high-carbon stainless steel used in most production knives and in some handmade knives. Works well through tooling. Content: Carbon 0.60 to 0.75%, Manganese 1.0%, Chromium 16.0-18.0%, Molybdenum 0.75%.